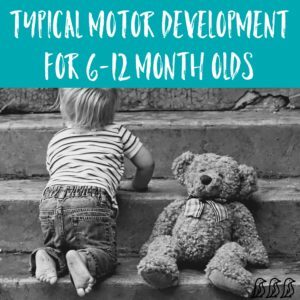 Below is an outline of typical motor development, but keep in mind that children grow & learn at their own pace. Both of my boys were very early with motor development, but slower with their verbal development; & I know plenty of kids who were the exact opposite! If you are ever concerned about your child’s development, we encourage you to speak to your child’s doctor. Babies will start sitting in a tripod position & gradually improve their stability while sitting. They will start to push up onto all fours when placed on their belly, & they might enjoy rocking back & forth on all fours or on their belly. At this stage, babies begin to support their weight on their legs while being held by an adult. Many babies become much more mobile during this period of development. They are able to transition to different positions – belly to all fours to sitting & back again. Babies will begin to pull themselves to a stand, & walk while holding onto furniture. They will work on crouching down & picking up toys that they may have dropped. The big milestone of walking often happens right around the 12 month mark! As parents, it is in our nature to compare our child to others & worry about their development; but I encourage you to try to enjoy these amazing milestones as your child achieves them! There are always ways to help encourage your baby’s development, but in the end, they are their own unique little person with their own unique ways of growing & learning. As long as your baby has your love & support, they are going to grow up from adorable babies into amazing kids!